Van Eeghen (van Eeghem, Eegen, Egen, Egene, Hegen), a Dutch Mennonite family, numerous members of which, usually merchants or bankers, have been important members of the church both by their generosity and their loyalty, often serving it as deacons or even as ministers. Many wealthy members of this family have rendered valuable service to the Dutch nation, and especially the city of Amsterdam, by their charity, their promotion of public welfare, and their cultural and artistic contributions. The ancestor of this van Eeghen family was Adriaen van Eeghen, of whom nothing is known but the name. His son was Christiaen, born ca. 1565, died ca. 1660. They lived and died at Cortemerck (Kortemerk), some miles south of Bruges in Flanders, Belgium. The name van Eeghen is derived from a farm called 't Eeghem near Cortemerck, which they leased. Both Adriaen and Christiaen seem to have been Catholic, as were also Christiaens children in their youth. One of Christiaens sons, Christiaen de Oude, born ca. 1595 at Cortemerck, left the Catholic Church and immigrated to Aardenburg, Dutch province of Zeeland, about 1632 as a cloth-merchant. Here he joined the Mennonite Church and became a prominent lay member of the congregation; in 1665 he promoted the building of a church (Doopsgezinde Bijdragen 1877, 10-11), and in 1657-1662 he negotiated with the city government concerning exemption from military service on payment of a head tax (Doopsgezinde Bijdragen 1879, 32-34). He died at Aardenburg in 1669. Adriaen van Eeghem, also a son of Christiaen van Eeghen and a brother of Christiaen de Oude, moved from Cortemerck to Aardenburg about 1645, where he joined the Mennonite Church; his son was Adriaan van Eeghem, a well-known Mennonite minister of Middelburg. Christiaen's youngest son, Thomas van Eeghen de Oude, a linen-trader, also left Flanders and resided in Middelburg, capital of the Dutch province of Zeeland, where he became a citizen in 1646, and died in 1657. His son Thomas van Eeghen de Jonge, born at Cortemerck (year unknown), lived at Aardenburg 1654-1662, where he was a deacon of the congregation; from 1662 until his death in 1693 he served as a preacher of the church of Middelburg. He was married to Leuntje van Daele. Jacob van Eeghen, the son of Christiaen de Oude, born at Cortemerck 1631, emigrated with his parents to Aardenburg. He became very influential in the Mennonite congregation; he married Tanneken Hebberecht (1635-1661), a sister of Gillis Hebberecht, the preacher of the church of Aardenburg, of which Jacob van Eeghen was a deacon 1657-1659. In 1662 he moved to Amsterdam, where his descendants are now found. Shortly before his settling at Amsterdam, he was married to Maria Bocxhoorn (1637-1684), a granddaughter of Leonhard (Leenaert) Clock . Through this marriage he became one of the well-to-do Mennonite merchants of Haarlem (linen bleachers) and Amsterdam (trade to Baltic ports and Spain). Jacob van Eeghen also was a merchant (especially linen, but also linseed, salt, and wines). His business was very prosperous and he became wealthy, though he had to send large amounts to his son-in-law at Aardenburg, who had suffered from war and other calamities. Jacob van Eeghen is to be considered the forerunner of the later Handelshuis van Eeghen. He died in 1697, while visiting Aardenburg. Christiaan van Eeghen, grandson of Jacob, born 1700 at Amsterdam, died there 1747, a well-to-do merchant and shipowner. He extended his business to the islands of the Caribbean Sea (tobacco, cacao beans, pelts and furs from America). He was married to Cornelia Cornelje (1695-1749). Twice he served the congregation of Amsterdam as deacon. He is said to have been a kind and very generous man. He published (translated from the English) De konst der Vergenoegtheit (Amsterdam, 1728), by an unknown author. His grandson Christiaan van Eeghen, born 1757 at Amsterdam, died there 1798, married to Catharina Fock (1762-1807), who also served the congregation as a deacon, and associated with his brother Pieter van Eeghen in founding the Handelshuis (trading company) P. en C. van Eeghen in 1778, later called Van Eeghen en Co. The brothers were much interested in the American trade after this country had declared itself independent in 1776. They not only shipped all kinds of goods in large quantities to and from the States, but also the van Eeghen banking house, Huis of Negocie, procured loans for the new country, first in 1782. They also, together with other Dutch bankers, bought a large area of land in the state of New York, south and west of Lake Ontario. Projects were made to build a city here, to be called Nieuw-Amsterdam, but the city arose much later and was then called Buffalo. Christiaan van Eeghen became the director of the company founded to administer the land, soon called Holland Land Company. In this time P. and C. van Eeghen collected a large collection of books, pamphlets, maps, and caricatures concerning America, most of them now being in the Library of the University of Amsterdam. Soon after, during the war between England and France, business was very difficult and subject to great dangers and losses, and the assets and also the revenues decreased rapidly after 1796. Nevertheless Christiaan van Eeghen, who was a pious man, found time for his congregation, his family (five children), his hobbies (history and art), and his home country. He was a moderate Patriot. In 1795 he became a member of the Financial Committee of the city of Amsterdam. After a short illness he died on 9 May 1798, only 40 years old. Jacob van Eeghen (grandson of the foregoing), born at Amsterdam 1818, died there 1834, left behind a number of sensitive poems, some of which were published in 1835, entitled Keuze uit nagelaten gedichtjens . . . (Molhuysen, P. C. and P. J. Blok. Nieuw Nederlandsch Biografisch Woordenboek: I, 790). Christiaan Pieter van Eeghen, born 1816 at Amsterdam, died there 1889, was a partner of the Handelshuis van Eeghen 1839-1889. Business was very slow in the post-Napoleonic era; in nearly all branches of trade there was a recession which was not restored until 1839. The Nederlandsche Handelmaatschappij (Dutch Trading Company), founded in 1824 by the king and supported by the government, did much harm to private companies like the Handelshuis van Eeghen. So young Christiaan Pieter had a hard time of it, but proved to be a good businessman. For this reason he was later appointed a member of the board of directors of the Dutch National Bank (1859) and in 1864 president of this board. He is known for his philanthropy and the promotion of public health by stimulating the building of better homes for workmen in his home city, and also for the founding of the Vondelpark, still a large recreation center of Amsterdam. He contributed liberally to many needy causes and many Christian institutions. He was also interested in the fine arts. On his instigation and with his financial aid the van der Hoop-Museum (now Rijksmuseum) was thoroughly improved and many old pictures restored. He founded the Koninklijk Oudheidkundig Genootschap (Royal Dutch Antiquarian Association). He is of special interest for church history and Mennonite history for his inclination to Christian revivalism (Réveil). Most of the outstanding revivalists in the Netherlands, like Heldring, Beets, and van der Goot, a Mennonite minister of Amsterdam, were his personal friends, whom he received in his stately house. He was very active too in missions, being a member of the board of the Dutch Mennonite Mission Society from the beginning (1847). He also served the church as a deacon (1845-1851). He was extremely averse to religious modernism, and watched the growing liberalism in his home church with grief and uneasiness. In 1842 he was married to Catharina Huidekooper, daughter of the (Mennonite) mayor of Amsterdam. "Christiaan Pieter van Eeghen was one of the greatest of all in his family" (Rogge, 342; Molhuysen, P. C. and P. J. Blok. Nieuw Nederlandsch Biografisch Woordenboek I, 789). 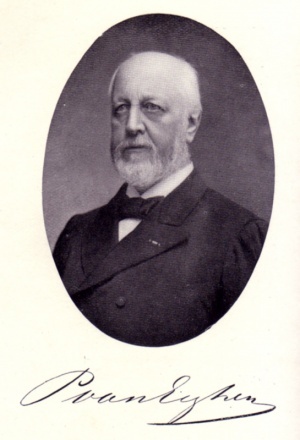 Hendrik van Eeghen, born at Amsterdam 1831, died there 1893, a partner in the Handelshuis van Eeghen and president of the Dutch National Bank 1884-93, served the congregation of Amsterdam as deacon 1857-61 and was treasurer of the Algemene Doopsgezinde Sociëteit from 1869 until his death in 1893. Pieter van Eeghen (son of the foregoing Christiaan Pieter, and like his father a partner in the same Handelshuis van Eeghen 1872-1907), born Amsterdam 1844, died 1907 at Cortemerck near Nijmegen, was a member of the city council of Amsterdam 1878-1899 and of the provincial government of North Holland 1877-1907. Like his father he was a patron of the arts. He was the founder of the Stedelijk Museum (city art gallery of Amsterdam), and for more than 25 years was president of the Oudheidkundig Genootschap, established by his father. But in addition to contributing his affection, his time and his money, he was also active in writing. He published Jan Luyken en zijn bloedverwanten (Amsterdam, 1889), and, together with J. Ph. van der Kellen, Het leven en het werk van Jan en Casper Luyken (2 vv., Amsterdam, 1905), a magnificent book containing the biography and description of the etchings and drawings of Jan Luiken, illustrator of the Martyrs' Mirror, and his son Caspar. He published Jan Minnaerts, a very interesting study of the relief of the poor among the Mennonites (in Doopsgezinde Bijdragen 1907). In 1872 Pieter van Eeghen married Maria de Clercq, of an old Mennonite family. He had great love for the church. Three times he served the congregation of Amsterdam as a deacon. From 1881 to 1907 he was member of the executive board of the Algemene Doopsgezinde Sociëteit, serving as treasurer 1892-1907 (Molhuysen, P. C. and P. J. Blok. Nieuw Nederlandsch Biografisch Woordenboek I, 790-91; Doopsgezinde Bijdragen 1907, 195-204, with portrait). Samuel Pieter van Eeghen, born 1853 at Zeist, died 1934 at Amsterdam, associate in the Handelshuis van Eeghen 1880-1934, member of the provincial government of North Holland, a member (1893) then president (1904) of the Amsterdam Chamber of Commerce, also served the congregation of Amsterdam as deacon (1878-84). Christiaan Pieter van Eeghen, Jr., a son of Christiaan Pieter (see above), born 1853 at Amsterdam, died 1917 at Oosterbeek, studied theology at the university of Utrecht and the Amsterdam Mennonite seminary, served as pastor in the congregations of Medemblik 1882-1883 and Aardenburg 1883-1892. Then he resigned and moved to Amsterdam. Here in 1892-1912 he served as pastor of a group of Mennonites who were meeting separately and had founded a Sunday school, because they did not agree with the general (liberal) trend of the congregation. In 1912 the group returned to the church, considering the preaching in the church to be sufficiently orthodox (Doopsgezinde Bijdragen 1912, 224). C. P. van Eeghen, Jr., published a historical study on his ancestor: Adriaen van Eeghem, Doopsgezind leeraar te Middelburg (Amsterdam, 1886); and a collection of sermons, including his Afscheidsrede at Aardenburg (Amsterdam, 1892). He was one of the editors (with J. W. van Stuyvenberg, J. Loosjes, and others) of De kleine Medewerker, later called Doopsgezind Maandblad voor uit- en inwendige zending. For a number of years he was on the board of the Dutch Mission Society. In 1886 he was married to E. W. A. van Helden (1861-1915). They had no children. Christiaan Pieter van Eeghen, the son of Pieter, born 18 February 1880, at Amsterdam, married in 1906 to Henriette Heldring, studied law at the university of Amsterdam, was a partner in the Handelshuis van Eeghen 1908-1924, director of the Dutch-Indian Trading Bank (later called National Trading Bank) from 1924, a member of the Amsterdam Chamber of Commerce 1921-1952, and its president 1945-1952. He died 28 July 1968. He served the congregation of Amsterdam as a deacon 1907-1911, 1917-1921, 1927-1931; was a member of the board of the Algemeene Doopsgezinde Sociëteit 1920-1951, member of the executive committee 1932-1951, member of the board of directors of the Amsterdam Mennonite Seminary 1927-1932, and its president 1932-1951. Peter Hendriks, later also called Pieter van Egen (Eegen, also de Eegen, or van Eger (Eeger)), died 1770 at Nijmegen, Dutch province of Gelderland, a (unsalaried) preacher of the Nijmegen congregation 1717-1770 (Naamlijst and Hoop Scheffer), did not belong to this van Eeghen family. Doopsgezinde Bijdragen (1864): 2; (1865): 175; (1873): 46; (1876): 112; (1877): 9 ff., 11 f., 14, 18, 22; (1879): 18, 33, 35 f., 38, 47 ff. ; (1881): 12; (1883): 11, 22, 56; (1884): 37 f., 42, 63, 123; (1889): 108; (1897): 85 ff. ; (1898): 56 ff., 73; (1901): 123; (1907): 145, 195 ff. ; (1919): 224. Doopsgezind Jaarboekje (1837): 96 ff. ; (1969): 16-17. Hoop Scheffer, Jacob Gijsbert de. Inventaris der Archiefstukken berustende bij de Vereenigde Doopsgezinde Gemeente to Amsterdam, 2 vols. Amsterdam: Uitgegeven en ten geschenke aangeboden door den Kerkeraad dier Gemeente, 1883-1884: II, No. 2154. Lennep, F. K. van Ferzameling van Oorhonden, betrekking hebbende op het geslacht van Eeghen in Nederland. Amsterdam, 1918. Nederland's Patriciaat II (1911): 121-128; X (1919): 96-105. Rogge, J. Het Handelshuis van Eeghen. Amsterdam, 1948. Zijpp, Nanne van der. "Eeghen, van (van Eeghem, Eegen, Egen, Egene, Hegen) family." Global Anabaptist Mennonite Encyclopedia Online. 1956. Web. 22 Apr 2019. http://gameo.org/index.php?title=Eeghen,_van_(van_Eeghem,_Eegen,_Egen,_Egene,_Hegen)_family&oldid=141097. Zijpp, Nanne van der. (1956). Eeghen, van (van Eeghem, Eegen, Egen, Egene, Hegen) family. Global Anabaptist Mennonite Encyclopedia Online. Retrieved 22 April 2019, from http://gameo.org/index.php?title=Eeghen,_van_(van_Eeghem,_Eegen,_Egen,_Egene,_Hegen)_family&oldid=141097. Adapted by permission of Herald Press, Harrisonburg, Virginia, from Mennonite Encyclopedia, Vol. 2, pp. 159-160. All rights reserved.